A traditional zero-based budget (something I personally use) is a complete list, to the penny spending of all your take-home income. If listing out a laundry list of budget categories isn’t your cup of tea, perhaps you could consider budgeting using the 50/30/20 rule of thumb. 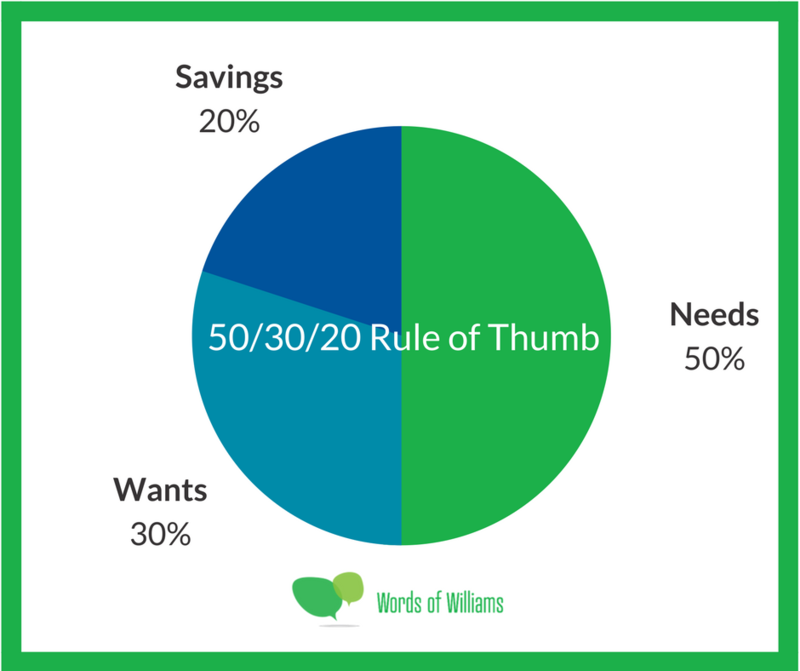 The 50/30/20 rule of thumb budgeting was (as best as I can tell) made popular by Elizabeth Warren and Amelia Warren Tyagi in their book “All Your Worth: The Ultimate Lifetime Money Plan.” I have not read the book, but have read various reviews and opinions of the 50/30/20 concept as a framework used in creating a macro level budget with appropriate allocation toward your needs, wants, and savings. So, what is the 50/30/20 method of budgeting and how can you use it to help you make better financial decisions? Starting with your net take home pay, multiply that by .5 and you get the amount of money you should be spending on your needs. Quality of life seems to be the measurement by which you determine a need vs. a want. It’s probably what keeps most people from completing or sticking to this kind of budgeting. My needs and your needs might be a little different, but our wants vary widely. And we all have a tendency to blindly force some wants into our needs column. A question to ask yourself to help distinguish between needs and wants would be: If I remove this thing from my needs column will it significantly impact my quality of life? Some of those are easier judgments to make than the others. And you’ll have to decide what’s right for you in your situation. This category should remain at 50% of your take home pay. That’s the main point. If I lost my income, could I live without these items on a monthly basis? Again, we humans try to justify our way through our budget categories until 100% looks like needs. You’ll have to be honest with yourself on these to make the 50/30/20 rule work. This seems to fall a little bit in line with the baby steps. If you can put 20% of your income toward savings, and you have debt, it would be wise to pay off the debt first with that 20%. This would be referred to by Dave Ramsey as “gazelle intensity,” where the goal (intensity) would be to increase the 20% of savings to as high of number as possible, even if that means robbing from your “wants” 30% category. The more wants you cut out and the higher your savings rate, the quicker you can get out of debt and move on to the next goal. Other savings goals would be emergency fund, retirement savings, larger investment goals, paying off the mortgage, etc. This a slightly more detailed budget, but I think that a young couple who didn’t have kids should be able to make something like this work. Notice there is $350 in an “other” category in the “Wants” section. There is some wiggle room there. I think it’s more of a tracking measurement used to create boundaries around how you spend your money. The 50/30/20 rule is a good way to gauge if you are taking care of the big important financial goals. I like that savings is one of the three cores as it lends itself to the “pay yourself first” mentality. At the end of the day, being intentional with your money and how you spend it is the most important thing. Having a vision and goals for what you want to accomplish and then setting up a budget or spending plan to help get you there. Have you compared your spending to the 50/30/20 rule of thumb? How does your spending stack up against the 50/30/20 rule of thumb?